As I was heading to the post office today, I was wearing a big bright smile on my face as the perfect accessory for a great day. I was going to pick up my parcel containing Benefit Chinese New Year 2019 Sets. These are courtesy of Escentual, a website from which I often shop for luxury and high end brands. I often recommend Escentual offers in my post as they have the lowest prices for high end brands (up to £5.00 lower than other stores) and not to mention their 20% or 25% discounts. They deliver World Wide and in UK you get FREE delivery on orders over £30.00. 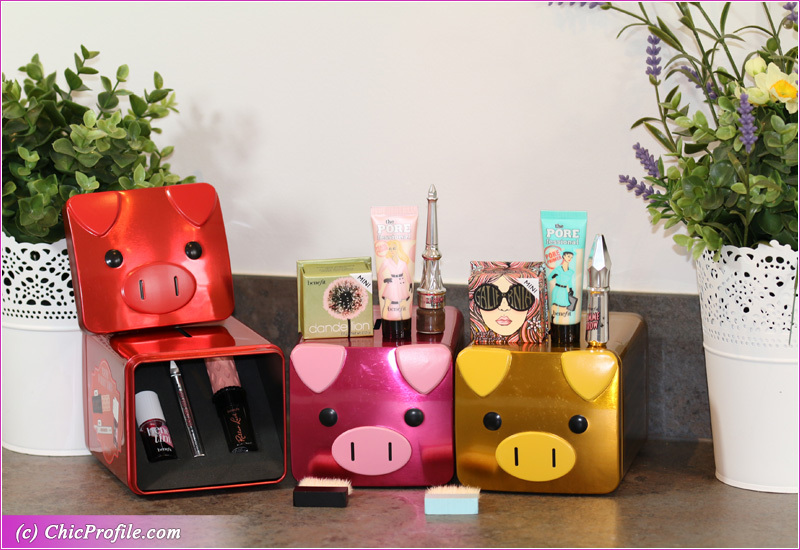 Escentual celebrates Chinese New Year with these super cute Benefit Gift Sets. There’s no set date for Chinese New Year, but traditionally, it is celebrated for 16 days from New Year’s Eve until the Lantern Festival. This year, Chinese New Year falls on February 5th. Every year starts a new animal’s zodiac year. This year it’s the Year of the Pig! 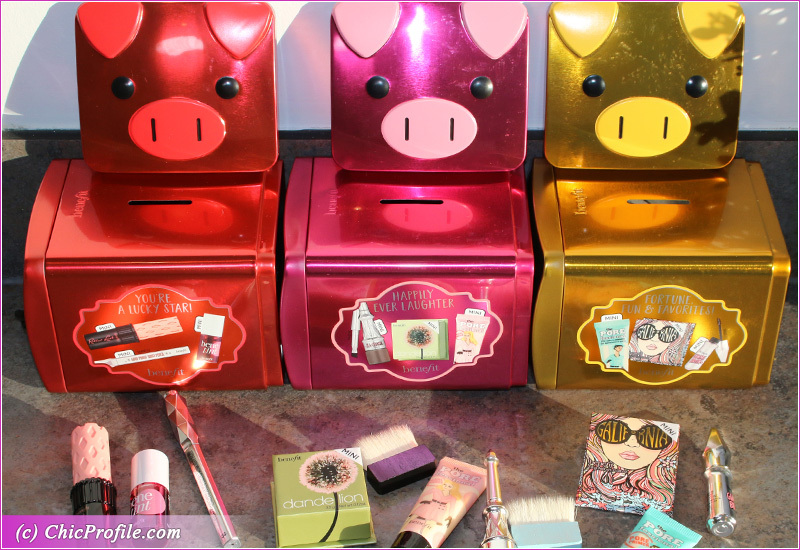 So here you have it, three makeup sets by Benefit packed in these cute metal tin piggy boxes. Chinese Year of the Pig is my favorite, even though I wasn’t born in the year of the pig, but because I love piggies as much as I love the pink color. So yes you can say that I’m obsessed a little big time! Each Benefit Chinese New Year Set retails for £26.50 / $31.00 and feature 3 mini makeup products. I’ve already have in full size some of these products, that I purchased a while back. 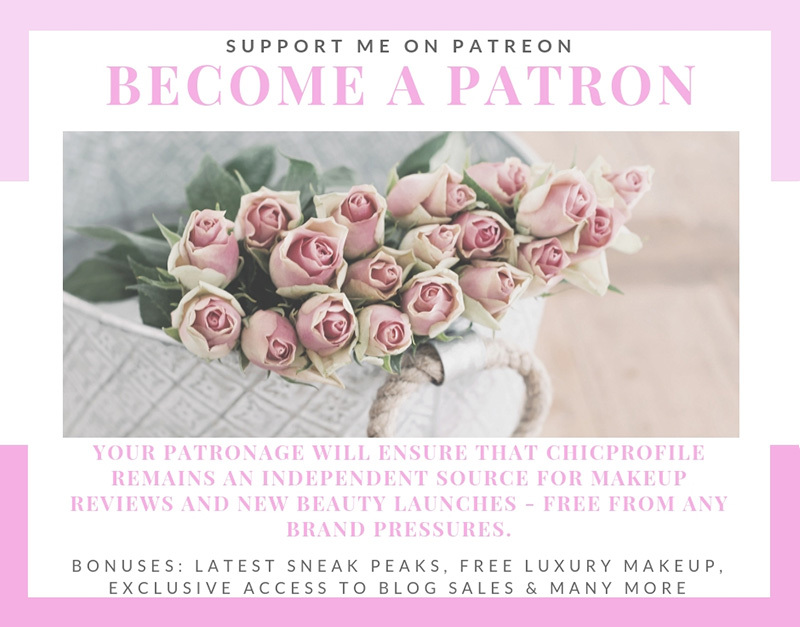 One of my favorites being Benefit GALifornia Blush (review, swatches) that I purchased it from Sephora when it launched at Sephora. I packed the GALifornia blush with me a few times when I traveled so I’m so happy to have it in the mini version now. All of these minis are so practical when you travel or for everyday use and a lighter makeup kit in your bag. 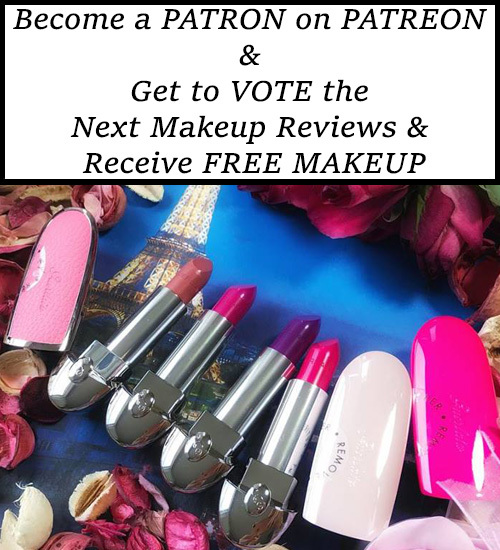 You can choose the set you feel you’ll use the most, or you can enjoy them all together as I think all of these products are necessary makeup items. Is hard to decide which is my favorite so I’m glad I didn’t have to make a choice. 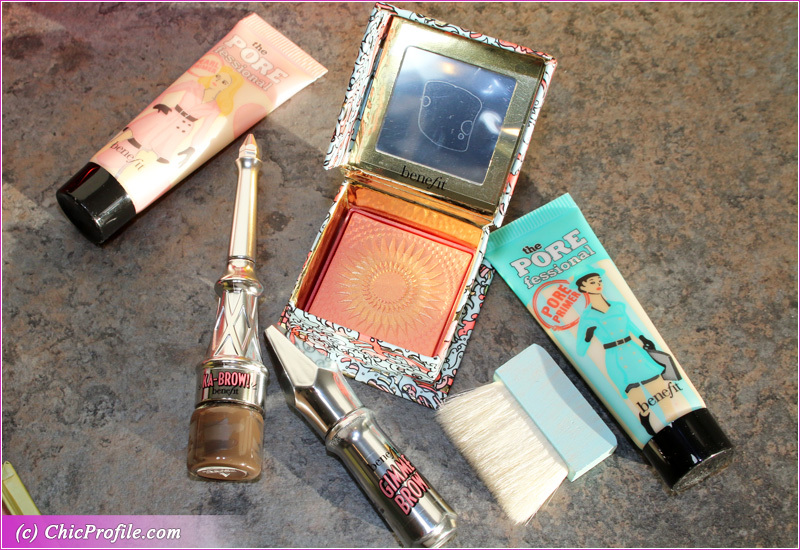 In terms of personal preferences, I love all the products featured in the Yellow Piggy which is Benefit Fortune, Fun & Favourites! Gift Set. I know I’ve tried them all 3 of them over the years and I still have the blush and primer. 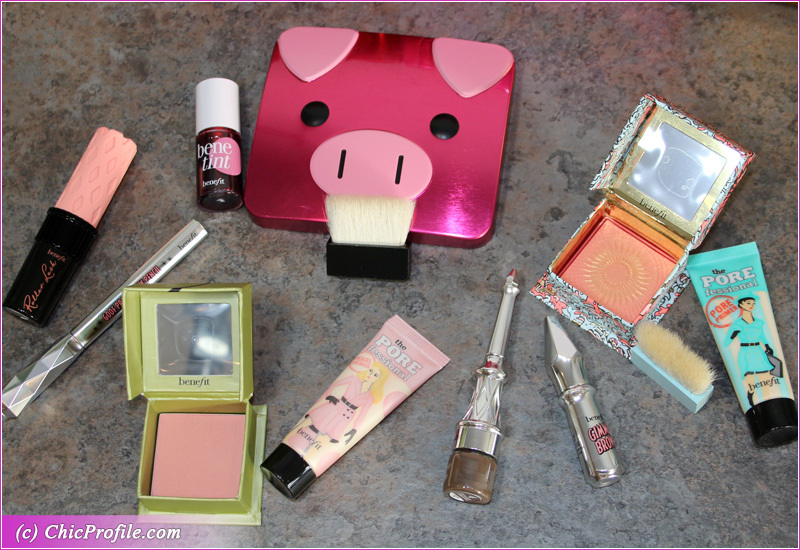 In terms of color choice, how I cannot love the Pink Piggy which is Happily Ever Laughter Gift Set but also because I never got to try the Dandelion brightening face powder. It know the shade is meant for fair and light skin tones and has great reviews, but I never got to try it. Having to use minis is great for me as I don’t remember when I last hit the pan on a full size blush, highlighter or palette. The other new product for me that I put to the test right away is Benefit Roller Lash Super Curling & Lifting Mascara. It separates and lifts the lashes pretty well while its enriched formula with provitamin B5 and serin will fortify lashes.